Today was a very busy day and I still have lots more to do before stopping for the night. I'm having my oldest son's birthday dinner and party here tomorrow, so I have been busy shopping and cooking for that. I am making chicken divan for tomorrow night's dinner and since I am the only wheat/grain free person that will be there, I am using this as an opportunity to make a separate small version for myself which will involve trying to make a wheat/grain free sauce substitution for my little casserole (I will substitute browned buttered almond flour for the bread crumb topping on mine and the rest will be the same; chicken, cheddar cheese and broccoli. Once I conquer the sauce part, which I intend to do...I will post that recipe, hopefully tomorrow. Once I get done with this post, I have a birthday cake to bake too...I may never get to bed tonight! 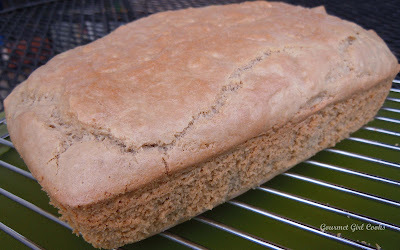 My big news today is that I finally tried the recipe for homemade grain free bread that I've been wanting to try. It's made with coconut flour, eggs, raw organic cashew butter, apple cider vinegar, baking soda, sea salt and almond milk. The recipe also called for the addition of honey which I omitted and substituted one teaspoon of Truvia for instead. 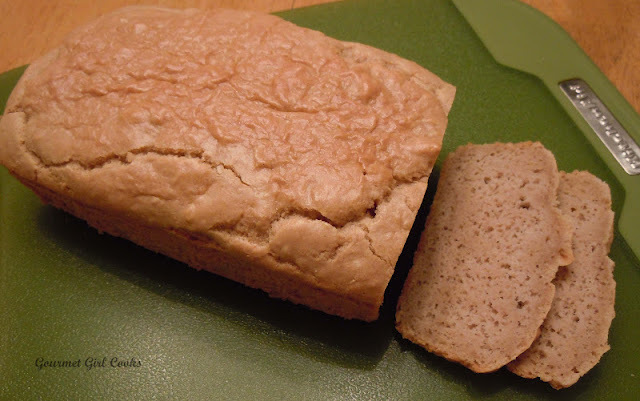 First of all, I want to say it actually "tastes" good...it's a bit dense, more like a quick bread (think banana bread without the nuts) and it is moist (in a good way). It slices nicely into thin slices with a sharp knife. I tried 2 small slices with butter with my dinner tonight (which was simply rotisserie chicken, since I ran out of time prepping for tomorrow's dinner) and I really enjoyed it. Okay, so now you know that I was pleased with how the bread turned out, but...(you knew there was going to be a but) it was sort of a pain to make. The recipe stated that you could use either a stand mixer or a hand mixer, so I decided to use my hand mixer instead of the KitchenAid. Blending the cashew butter with the raw egg yolks felt like a "Mission Impossible". I felt like what I really needed was a "cement mixer" to blend it together. The mixture crawled up my beaters towards the handheld piece because it was so thick and stiff. This was another one of those recipes where there were a few bad words flying around...and a lot of "seriouslys???" as well. If the cashew butter wasn't so darn expensive, I might have just thrown in the towel and thrown it away. The recipe is not a bad recipe...it just isn't for the faint of heart and was more tedious than expected (and I am an experienced cook/baker). It requires beating the egg whites separately until stiff, and then trying to fold them into a mixture that is as stiff as wet cement, maybe more so...and trying to get the light and fluffy to blend with stiff and sticky. I finally got it together and in the oven and fully expected it to not to be any good...but I was pleasantly surprised by the final product. This is not a cheap recipe to make either. The specific organic raw cashew butter recommended for this recipe was $17.28 and this recipe uses 1 cup of it, which ends up being a bit more than 3/4 of the entire jar. This means that you could not make 2 loaves from 1 jar of this cashew butter. So, my final review was that yes, this bread tastes really good and I look forward to having some with my breakfast tomorrow. But, not only is it a bit more difficult to make than the "norm" for baked goods, it is quite pricey to make as well. 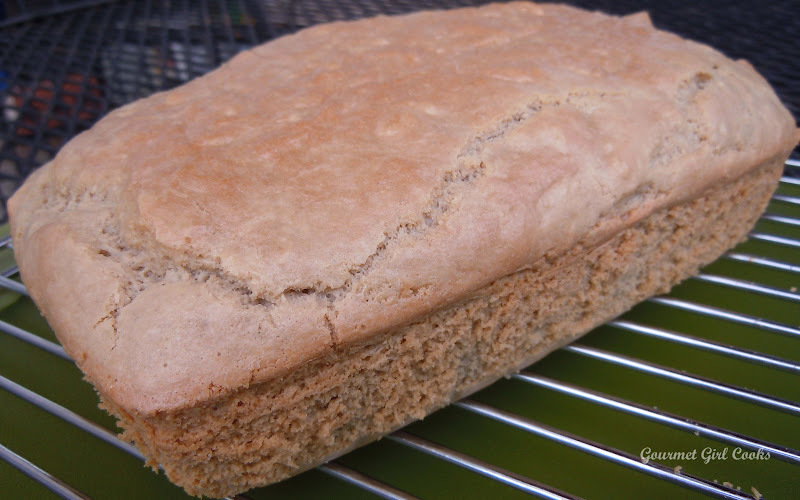 While I would definitely make this bread again...it is definitely not something that I would want to do on a weekly or regular basis just to have bread. Also, next time I will try my KitchenAid mixer. Below are a couple pictures of the bread as well as a link to the recipe. Enjoy! well it lQQks awesome! I think the stand mixer would have helped, also, what about natural peanut butter instead of cashew butter? It's much cheaper. I want to make this bread! How funny! I just made one of her recipes yesterday - the grain free cereal bars. They were SUCH a pain in the rump, but so worth it in the end. Everyone in our house loved them. But, yeah, I let a few "seriously?? "s fly during my time, too! LOL Sara...I just wanted to make sure folks knew..."YES, it was good"...but "NO, it was not easy!" I am an experienced cook and can make almost anything. I wanted to make sure that if a more novice, less experienced cook tried this recipe, and found themselves struggling, that they didn't feel like a failure. This was just a more difficult batter to make than most.